Here at StoryToys we’ve had the privilege of working with many talented people, and our latest project is no exception. We’ve teamed up with Sir Patrick Stewart (X-Men, Star Trek), Michael Frith (The Muppets, Fraggle Rock) and Bob Tedeschi (New York Times, Bobo Explores Light) to create a fun-packed educational puzzle game. Leonardo’s Cat features the voice of Patrick Stewart as Leonardo da Vinci, with writing by Bob Tedeschi and design by award winning creator and illustrator Michael Frith. The game takes players on an imaginative adventure filled with challenges, storytelling and artwork inspired by 16th-century France and the Renaissance. When Leonardo da Vinci’s latest invention, the Automaton, the world’s first robot, is stolen by his devious archrival Michelangelo, Leonardo’s long-suffering cat Scungilli must embark on a quest to recover its scattered pieces. To do so, players will have to use the ingenious creations of da Vinci himself to outwit and overcome the many obstacles, traps and dangers of the ancient town of Amboise. Find out more here. In this behind the scenes video Michael Frith, Patrick Stewart and Bob Tedeschi talk about their contributions to the game and what Leonardo da Vinci means to them. 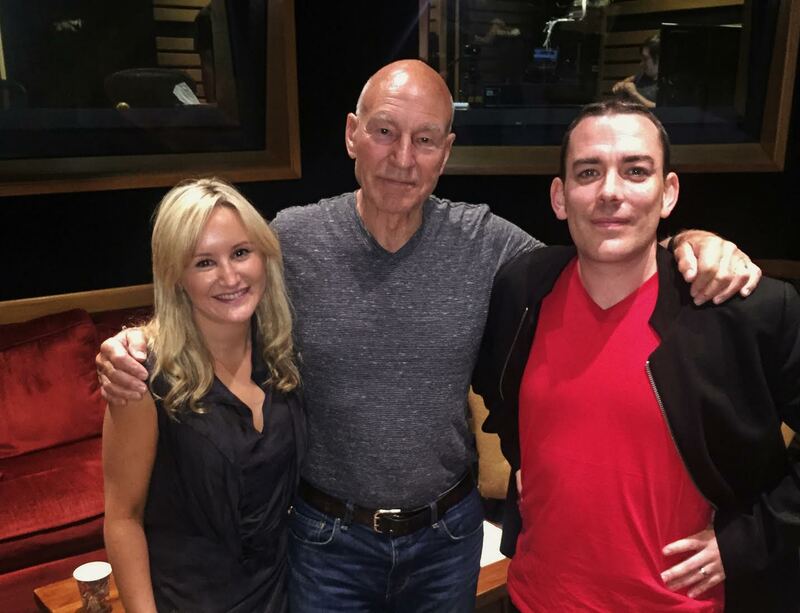 StoryToys’ CPO, Emmet O’Neill and Producer Ciara Moore with Sir Patrick Stewart at the recording studio.